1. a) Deﬁne the term “apprentice” as applied in the engineering ﬁeld. b) Explain the term “break-even" as used in business. 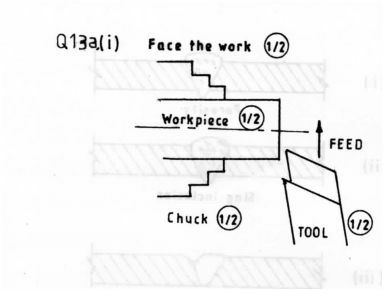 2 a) List three uses of a steel rule. 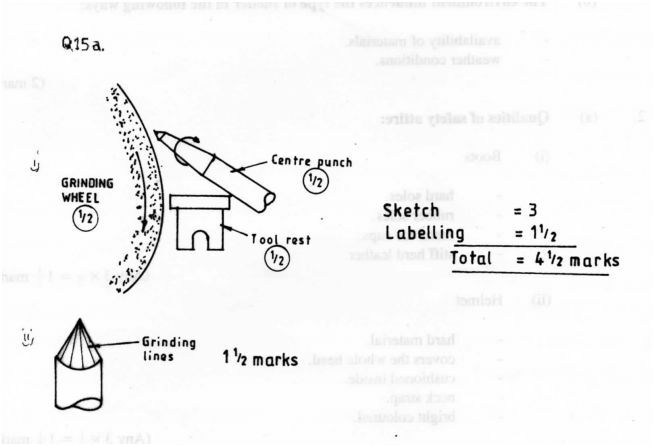 b) (i) With the aid of sketches, distinguish between a dot punch and centre punch. 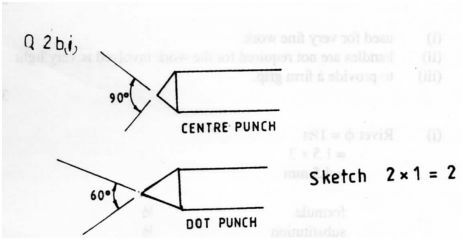 (ii) State two uses of a dot punch. 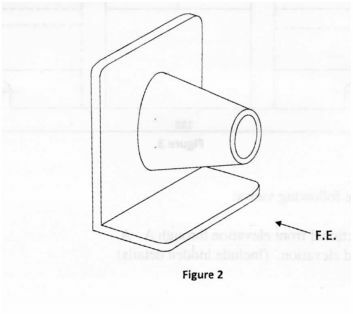 3 a) State two reasons for edge treatment on sheet metal articles. b) Outline the procedure of ﬁnishing a work piece by painting. 4 a) Outline the process of case hardening a vee block. 5 a) Deﬁne the term “upsetting” as used in forging. b) State two reasons for twisting metal bars. (iii) the reason for knurling one end. 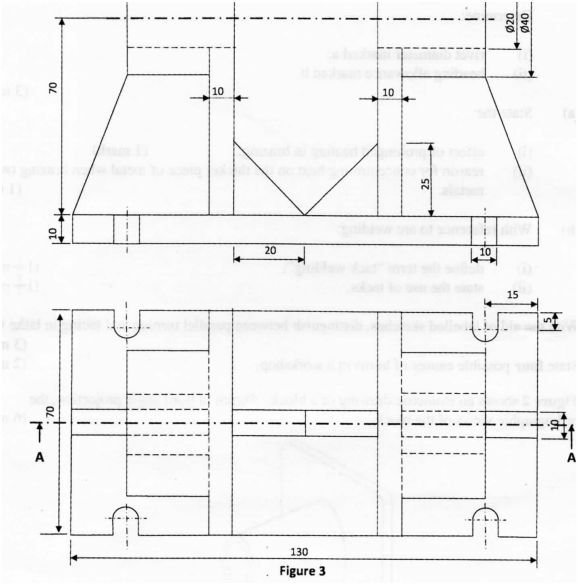 (b) Figure 1 shows two mild steel plates of equal thickness to be rivetted. (ii) state the use of tacks. 11. 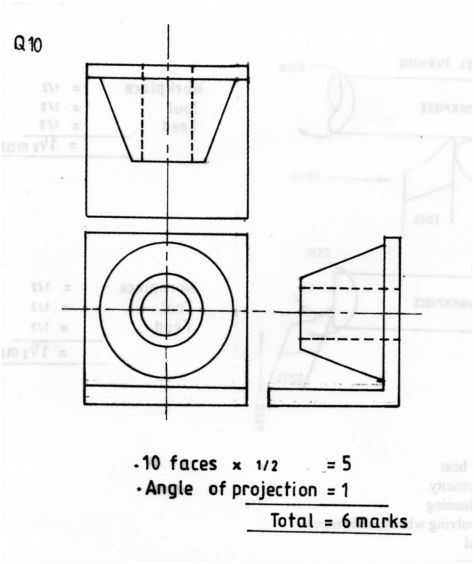 Figure 3 shows two views of a machined component drawn in ﬁrst angle projection. 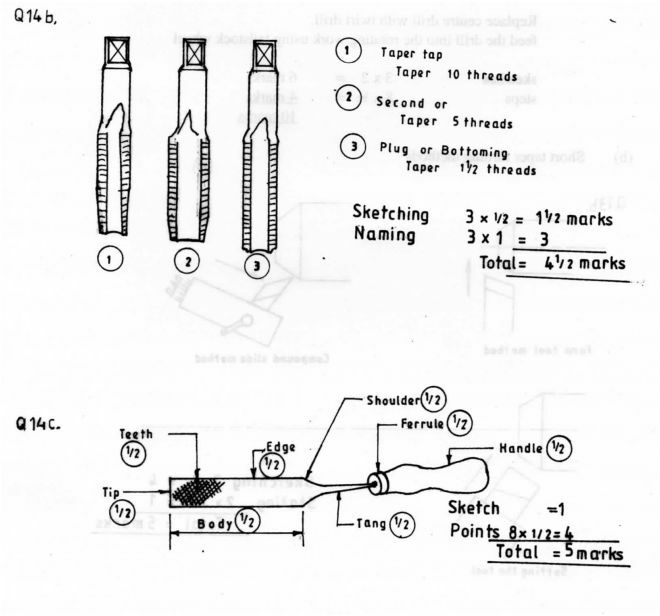 (i) sectional front elevation through A - A.
b) Name and sketch the three thread taps which make a set. 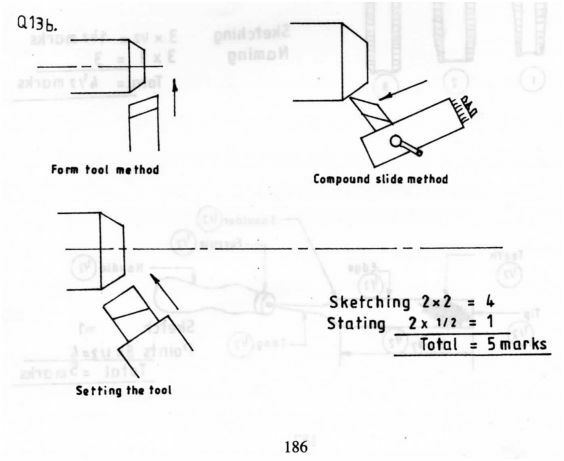 c) Sketch in pictorial a hand ﬁle and label all its parts. (i) a centre punch is ground on a grinding wheel. 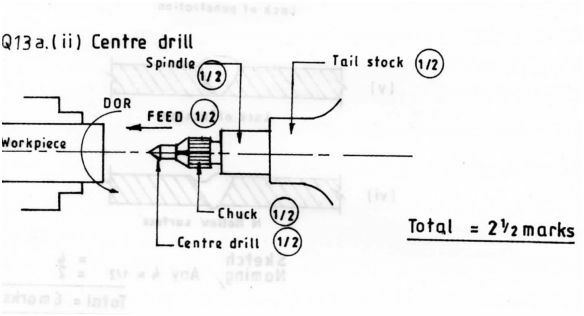 (ii) the grinding lines should appear on the ground surface of the centre punch. b) (i) Chromimium - imparts stainless properties and adds to hardness. (ii) Manganese - increases resistance and adds strengths. 5. a) Process of increasing thickness at expense of length. b) - To increase its strength. 6 a) (i) used for very ﬁne work. (iii) to provide a ﬁrm grip. 7 a) (i) It causes scale to work into the joint. (ii) So that both parts are brought to the correct heat at same time. (b) (i) They are short runs at intervals along the joint. (ii) They assist in keeping the plates to be welded in perfect alignment or Holding two pieces of metals together. 12. a) Verify that all cables insulations are intact. Make sure all terminals are secure. Ensure that the conductors used are of the correct current rating. Ensure that the equipment is adequately earthed. Be familiar with locations of the “off” positions of the mains switch. Disadvantage - dirtiﬁes the surface. Disadvantage - rod tends to stick on weld. hold chuck on the spindle of the tailstock. lock the tailstock on the machine bed. 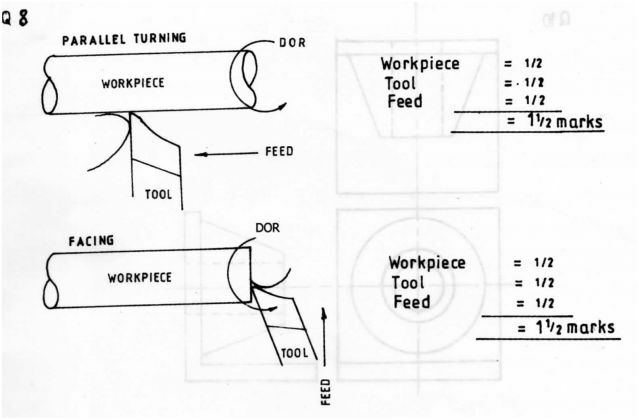 feed the centre drill into the rotating work-. 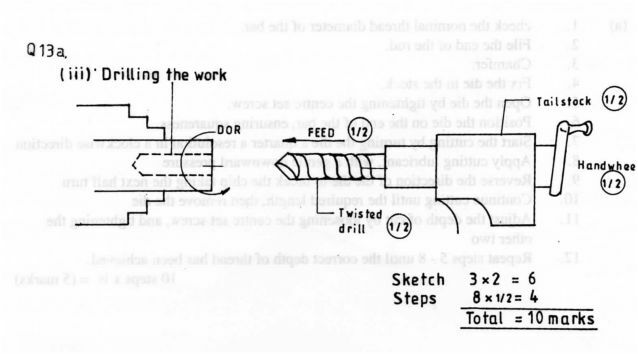 - Replace centre drill with twin drill. 14. (a) . 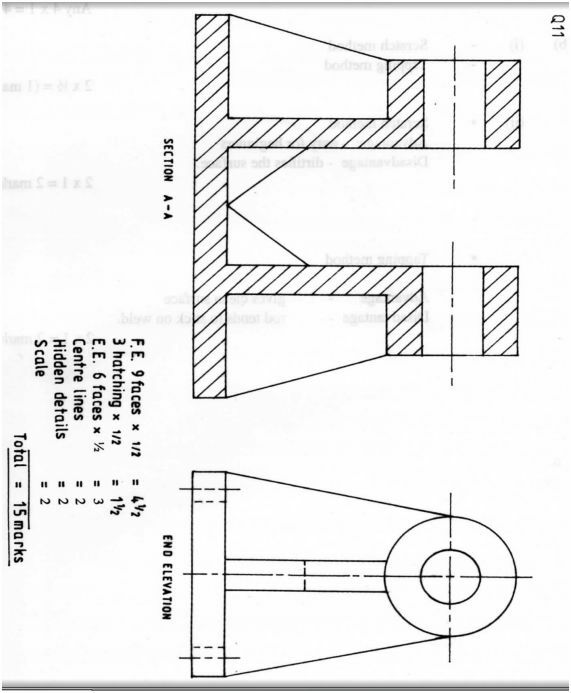 check the nominal thread diameter of the bar. File the end of the rod. Fix the die in the stock.
. Open the die by tightening the centre set screw. Position the die on the end of the bar, ensuring squareness. 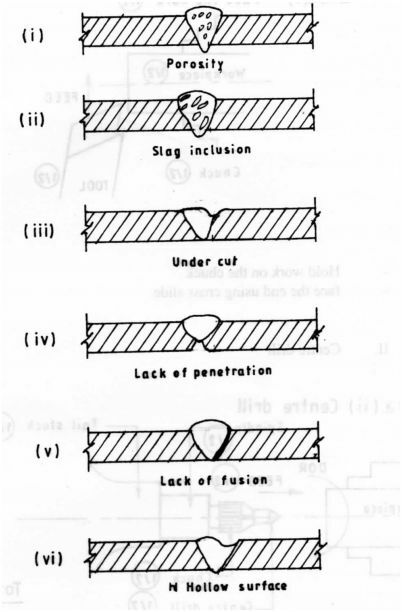 Adjust the depth of cut by loosening the centre set screw, and tightening the other two Repeat steps 5 - 8 until the correct depth of thread has been achieved. l5. (a) (i) Excessive speed for the material being cut. Lack of a suitable cutting solution. (ii) Excessive lip clearance angles. (ii) Goggles should be wom all the time. (iii) The tool rest must beadjusted to be close enough to the wheel. (iv) Work should be ﬁrmly held. (v) Use the guards on the grinding machine. (vi) Never touch the revolving wheel while grinding.